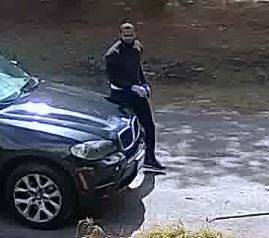 JACKSON-The Jackson Police Department is seeking the public’s assistance in identifying the suspect of a residential burglary which took place on Monday March 5, 2018. In the afternoon of Monday March 5, 2018, Police Officer Sean Greenberger responded to a residence on Cedar Swamp Road which is located between West Fish Road and West Pleasant Grove Road on the report of a burglary which took place at approximately 11:56 am on this date. The residents returned home and discovered that several rooms of the house had been ransacked. Various pieces of jewelry, cash and guitars with a value in excess of $5,000.00 were reported stolen. The homeowner did have a video surveillance system and images of the suspect and his vehicle were recorded and are attached with this release. The suspect is described as a black male with short black hair and a longer beard, wearing a dark colored sweatshirt and pants and light colored gloves. The suspect vehicle is described as a dark colored BMW 4 door SUV. The suspect was first observed pulling into the driveway at approximately 11:38 am and knocking on the door of the residence. After several minutes of waiting, he drove away but returned at 11:56 am and walked toward the area of a first floor window which was discovered to be open with the screen removed. 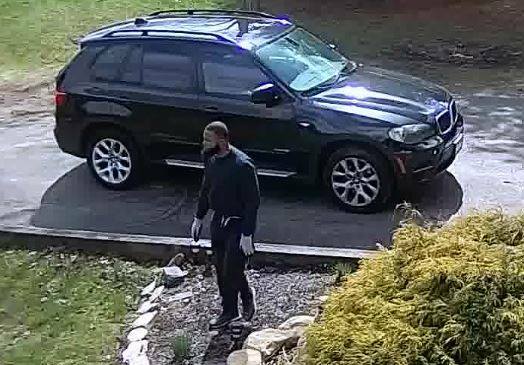 He was then observed leaving the residence at approximately 12:09 pm after placing items from the residence inside the SUV and then driving away. Please share the attached images of the suspect and anyone who may have witnessed anything or who may have knowledge of the suspect’s identity is asked to contact Jackson Police Det. Robert Reiff at 732-928-1111.